I needed something quick and filling for lunch yesterday that would still fit in with the Simply Filling program I am following via Weight Watchers Online. We had been away over the weekend and hadn't yet done a big grocery order. Grace was already fed, so all I had to do was worry about myself, but when I opened the fridge to take inventory of the contents, I had no idea what I was going to make myself for lunch. I spotted a container of leftover quinoa and it hit me! 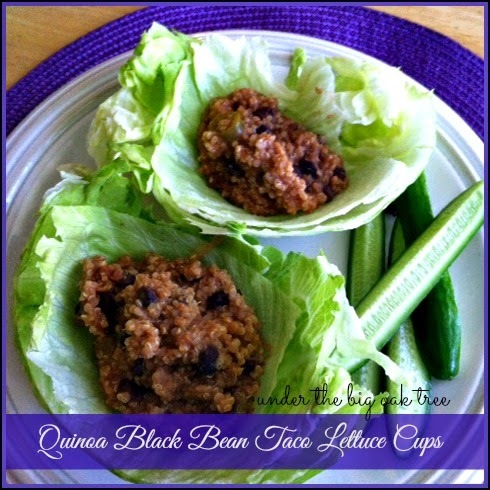 Quinoa Black Bean Taco Lettuce Cups! Easy, delicious and filling! Perfect! Add all ingredients to a small pan, stirring to combine. Cook over medium heat until thick and bubbly. Divide over lettuce leaves, serve. This was such a delicious and easy meal! I ate the entire pan for lunch, divided between two "lettuce cups". I used iceberg lettuce which made for some large (and somewhat messy) cups. Next time, I'll use romaine leaves and use less of the mixture for each lettuce wrap. Fat-free mozzarella cheese would also be a good addition if you feel you need cheese to make these more like tacos. These look so good! Thank you so much for linking up at Tasty Tuesday! Your recipe has been pinned to the Tasty Tuesday Pinterest board! Please join us again this week!